Hi Friends: Today's post is an altered trinket box that is about 2 3/4" square and originally was off-white with a gold edge on the sides of the box top. It actually holds the grommets that I used on the box. See below for my process, challenges entered, and products used. Thanks for taking a look. Have a super day! I started by applying gesso to the box top and the sides of the box bottom. I also applied gesso to the wood pieces, charms, grommet, and flowers. Once dry, I covered the box with modeling paste and used my palette knife to create the texture. I added the metal tag, charms, wood pieces, flowers, lace and grommet to the box top, then used the below colors of Lindy's Stamp Gang to color everything - a bit of spraying, a bit of painting, and loads of fun! I wanted to add a bit more color, so I painted a bit of the FW red ink to areas of the box, the flowers and one of the charms - it comes out a bit more wine-colored because of the original blues that I used, but I really liked the additional color. Once all the colors were dry, I rubbed some Inka Gold onto the metals, woods, and flowers, but it didn't get quite the effect I wanted, so I brushed on tiny dabs of the Viva Decor 3D stamp paint in gold. 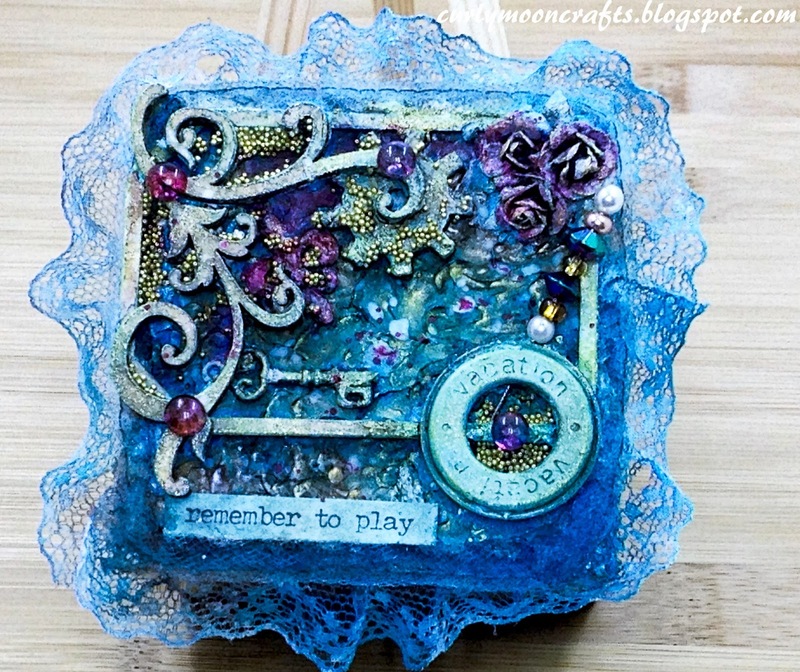 I colored the Chit Chat sentiment with the same LSG blues, then added it to the top of the box - I liked the "play" theme because I got to play a lot with this creation and because I used the vacation grommet - it all coordinated with my favorite beachy blue colors. I added the tiny gold marbles with matte gel medium, then added the dew drops to add a bit more of that wine color. I brushed the flowers and some other areas with gesso highlights, then added some splatters with the gesso and FW ink. I finished the project off with a stick pin and some beads from my stash. I really enjoyed this project! Prima flowers - This was from an older Prima set and I separated the tiny flowers from the larger flower to get the sizing right. This trinket box is a treasure! Love the glitter and floral elements! 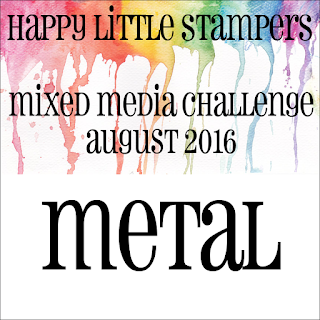 So glad that you join the fun over Simon Says Stamp Wednesday “Let’s Go Wild” Challenge! Awesome details and design! Super work! 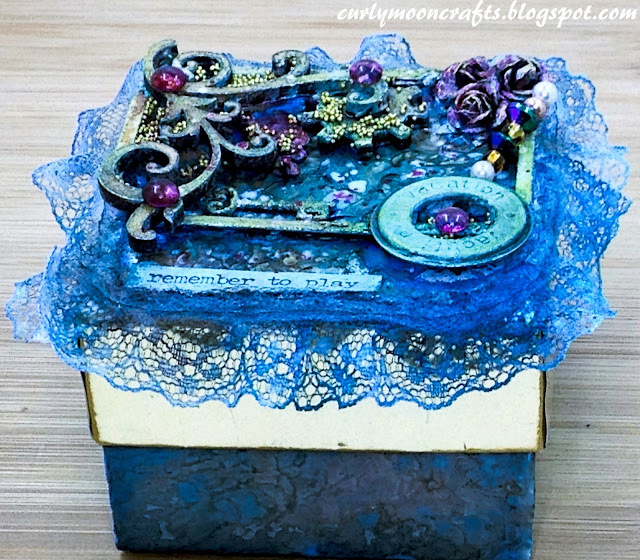 Your little box is really pretty and I really like the different textures and the blue palette is lovely with the gold highlights. Thanks for joining us at Frilly & Funkie for the "It's a small, small world" challenge. So many beautiful textures and layers of goodies! Beautiful box with lovely colors! 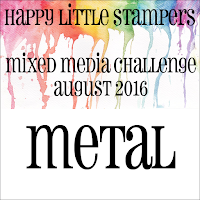 Thanks for playing along with us at the "It's a small, small world" Frilly and Funkie Challenge. What a creative piece of altered art Pattie. I love the gorgeous colours and your mix of textures! Beautiful textures and and totally whimsical feel feel.... awesome, thanks for joining us at HLS!! Fabulous transformation of your little box. Love all the sparkle and texture you added along with the bright colour. Thanks for joining us at Frilly and Funkie. Fantastic box. Love the colour and gorgeous embelishement.